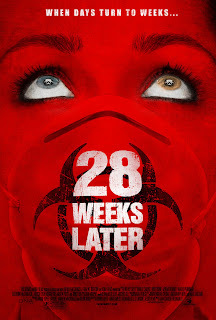 Arriving on DVD last week was "28 Weeks Later," the sequel to 2002's inventive "28 Days Later," the fearless and inventive Danny Boyle directed digital video zombie thriller set in a London overrun by humans infected with the rage virus. With a different director, and slightly altered stylistic approach, the sequel initially caused me worry, although it delivered in a way that few modern horror films do. But is that really saying all that much? Perhaps my only complaint is the film's use of the "familiar zombie" motif. Don't bother Googling that phrase as I just made it up to describe a zombie film's use of a recurring zombie to heighten tension, drama, and fright. In "28 Weeks Later," this part is played by Robert Carlyle, who begins the film as a cowardly husband who leaves his wife to die in a cottage on the outskirts of London in the aftermath of the initial viral outbreak. 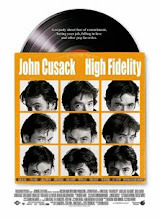 The film then flashes forward several months, and Carlyle is reunited with his two children, who were safely away at boarding school during the events depicted in the first film. Their reunion takes place at a U.S. Army run facility through which citizens are being repatriated back into England. Ultimately, after a number of plot developments I'll excise for my purposes here, Carlyle is infected and begins another outbreak of the virus. The thing is, Carlyle keeps reappearing and pursuing his children as they attempt to escape the facility and the U.S. Army's zealous attempt to exterminate all those who are infected as well as those who simply might be. Again and again, Carlyle resurfaces until a final encounter in an abandoned subway station, where he has somehow tracked his children and their remaining protector, though it is far from the original facility. How did he find them? Coincidence? Happenstance? The problem with this device is that it elevates the zombie character into a identifiable villain. Zombies, by their very nature, are anonymous members of an advancing horde of corpses. If we individualize them, they lose that which makes them the most frightful. Certainly, there is some drama and horror to be had in watching a character become infected and briefly chase his former friends and family. But allowing that to continue throughout and over the course of the film dilutes the concept and strays too close to the slasher-film genre where an all too familiar enemy keeps coming and coming and coming until the narrative's end. Other zombie films have made attempts to individualize the zombie. In George Romero's rather dull 1985 film "Day of the Dead," we see the theme carried out to its extreme as a captured zombie regains some of his personality and relearns his human response system. Building upon that, in Romero's far more recent "Land of the Dead," a single zombie essentially becomes the ringleader of a throng bent on attacking a fortified city. Romero seems fascinated with the natural evolution of the zombie, from its origin as an anonymous corpse to its elevation to some type of primitive sentient being. I think, therefore I eat brains? Of course, I'm a zombie movie heretic for preferring the fast moving zombies to the slow dull plodding ones of Romero's films. I'm really only a fan of Romero's original 1968 "Night of the Living Dead," which is the grandfather of the genre and as suspenseful as can be. Its first sequel, "Dawn of the Dead," was intriguing in parts but way too lengthy and slow moving for my tastes (and by today's standard's the anti-consumerist message couldn't be more heavy handed). And yes, I know that technically, "28 Days Later" and its sequel are not technically zombie movies as the films are about a virus with infects the living, not the dead.